Question: I am losing about half of my tomato crop because of fruit rot. Sunken round spots develop over the ripening fruit. The spots enlarge rapidly in warm weather. 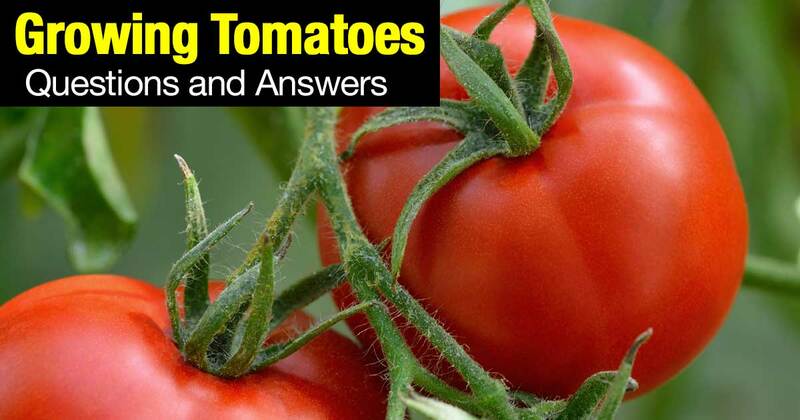 Answer: There are a number of tomato fruit rots. The majority, including anthracnose which you apparently have, can be controlled by staking the plants or using a tomato cage in the spring and mulching with grass clippings or leaves, to get the fruit off the damp ground. In addition, spray at seven to ten day intervals using maneb, zineb, captan or a multi-purpose vegetable or tomato spray containing one of these fungicides. Follow the manufacturer’s directions. These materials will also control the common and destructive foliage blights. Spraying should generally start when the first fruit clusters are the size of walnuts. Question: The older and lower leaves on my tomato plants are spotted, turning yellow and dropping off. I’m afraid the fruit will sun scald. What sprays do you recommend? Answer: Tomato blights are often controlled by spraying at seven to 10 day intervals throughout the season, starting when the first fruits are about one inch in diameter. Space plants for good air movement. Answer: Your seedlings were affected by what is called “damping-off“, prevalent where there is too much moisture and poor ventilation. Sow seeds in a mixture of equal parts loam, leafmold, and sand or buy a good bagged seed starting mix. A simple method of sterilizing soil before sowing is to fill the containers with the mixture. Water with boiling water a day or two before sowing the seed. Containers should be well drained. Answer: Tomatoes are attacked by fruit spots, wilts and blights. One of the most prevalent and hardest to control is fusarium wilt. At first the leaves curl, later turn yellow and die. This disease usually appears about the time the first fruits are ripening and starts at the base of the plant. The wilt moves up the plant finally destroying the entire plant and the fruit. Nothing can be done once a plant is infected by wilt. Another season plant the tomato plants in a new location, using so-called wilt resistant varieties. Question: Why do tomatoes grow good vines but bear no tomatoes? For two summers this has happened in my garden on ground where strawberries were formerly grown. LV, Iowa. Answer: Too much nitrogen in the soil, too much shade, plants too close together and inferior seed are some causes of a scarcity of fruit on tomatoes. If the temperature is low and the weather wet when tomatoes start blooming the blossoms are not pollinated and the fruit does not set. Later if the temperature becomes hot, above 100 degrees, the pollen is killed and fruit does not form. Usually, there is sufficient good weather for the plants to set a crop of fruit sometime during the blooming period. Question: The leaves on my tomato plants are mottled with a yellowish green to dark green pattern. The leaves are curled, crinkled and puckered. The plants as a whole appear stunted and bunchy. Have I done something wrong? Answer: Your tomatoes appear to have a virus disease – probably one in the mosaic complex. Sometimes the symptoms closely resemble 2,4-D injury with narrow, spindly, shoestring-like leaves. Fruits are often reduced in size and number. Check mosaic by controlling aphids on tomatoes (plant lice) which transmit the causal virus(es). Destroy the first infected tomato plant when found. Keep down all weeds growing in and around the garden area. Set out disease-free certified transplants, when possible. If a smoker, wash your hands thoroughly with soap and hot water before handling healthy plants. The same viruses may be in the tobacco you smoke! Question: The last two years I lost nearly half of my tomatoes because of a kind of dry rot. The bottom of the tomato would start rotting while it was still green and by the time it was ripe it was rotten all over. Is this a disease or a soil deficiency? What can be done? Answer: This disease is called blossom-end rot. Its appearance is first noticeable around the dried up blossom and gradually enlarges, taking on a black color. The disease is caused by conditions adverse to the normal growth of the plant. An uneven water supply seems to be the cause of this trouble. Irrigation will completely control it if properly used. It is most troublesome in a year of moisture extremes and affects plants that have been pruned and staked more than plants left undisturbed. Question: Last spring I grew fine tomato plants with lots of bloom but they all fell off. What caused that and what can be done for it? Answer: Bud drop of tomatoes may be caused by either extremely hot or cold weather just at blossoming time. Then too, excessive rains may actually wash away the pollen. These causes for bud drop are not controllable. Another common cause of this trouble is excessive nitrogen. Under ideal growing conditions, on a soil that contains excessive nitrogen, tomatoes make a heavy vegetative growth and refuse to set fruit. The remedy is to plant tomatoes on soil that is not too rich. For more on tomato disease problems check out the Cornell Vegetable MD Online Here.